It's not too late! We have partnered with Autisable.com to spread the bean bag love to families affected by autism. Anyone can enter, but we especially want autistic families to know how great bean bags can be! They offer a comfortable, fun place to feel safe in. Plus, they are portable, so even the smallest kid can tote it from room to room to make a cozy nook anywhere in the house. Our bean bags are also machine-washable and have child-resistant zippers on the liners. Very kid-friendly. Autisable.com highlights "Real Blogs from People Tackling the Puzzle of Autism". They are a fabulous organization that organizes and features the trials, tribulations, and successes of autistic families. We know that kids with autism can find it difficult to sit still in a traditional hard chair, so this prize will be welcomed we're sure! 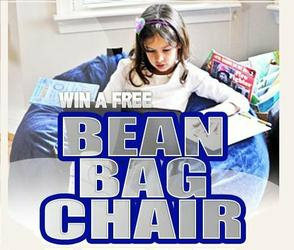 We are proud to sponsor this giveaway and hope that our bean bag will bring great joy and comfort! The giveaway runs until November 20, so don't delay! Check them out and enter at http://www.facebook.com/autisable.